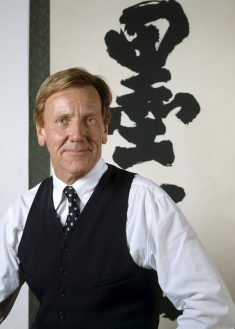 Director of the Art Gallery of New South Wales (1978-2011) Edmund Capon AM, OBE, is pictured with a calligraphy painting from his own collection in 1999. Photo: AGNSW, Jenni Carter. It is with great sadness that Create NSW acknowledges the passing of Edmund Capon AM OBE, director of the Art Gallery of New South Wales from 1978 to 2011. Edmund Capon was a greatly admired and distinguished arts leader in Australia and was responsible for transforming the Art Gallery of New South Wales into one of Australia’s leading cultural institutions and forging its global reputation. He brought great dedication to his work and a unique flair to all that he did. Edmund stood by his belief that great art should be available to all and under his leadership gallery admissions significantly increased; the collection was expanded; a new Asian gallery and contemporary galleries to house John Kaldor’s $35 million collection were opened and his dedication drew many generous benefactors to the gallery. Edmund leaves a significant legacy and will be deeply missed. Our thoughts are with his family, friends and former colleagues.